In September of 2017, our three months of tent camping in Scotland was two thirds complete. 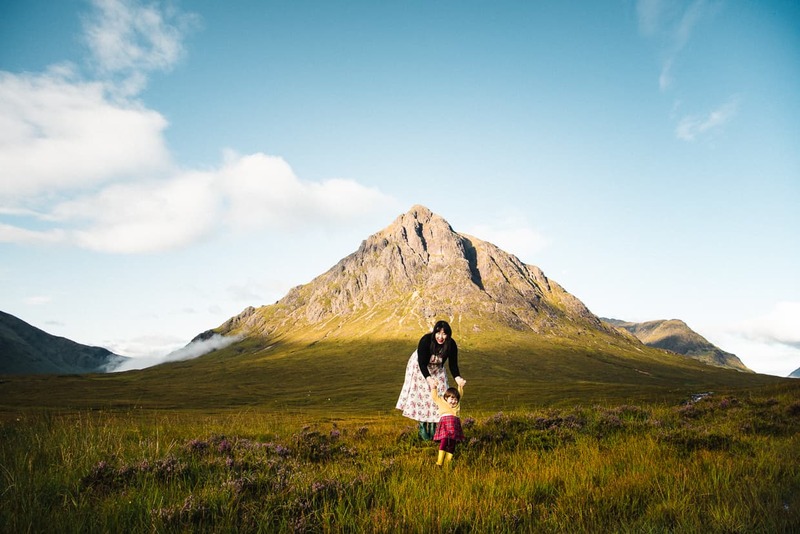 We had just finished July in Dunbar and August on the Isle of Skye, and we decided to wrap up the season with a month in the mountains of Glencoe before continuing our travels through Europe for the rest of the year. It was a crazy month for little Lisa, Dannie and Me. 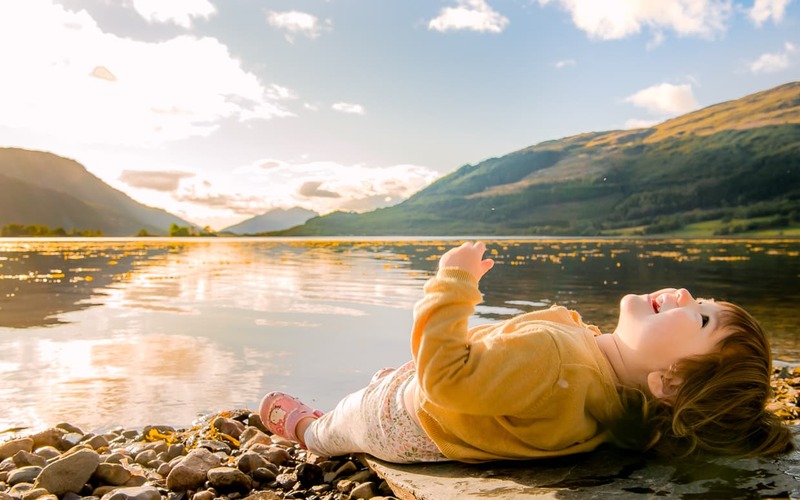 Glencoe is a preposterously beautiful place to spend a month, and we eventually set up our tent in the Invercoe Caravan and Camping Park (website). 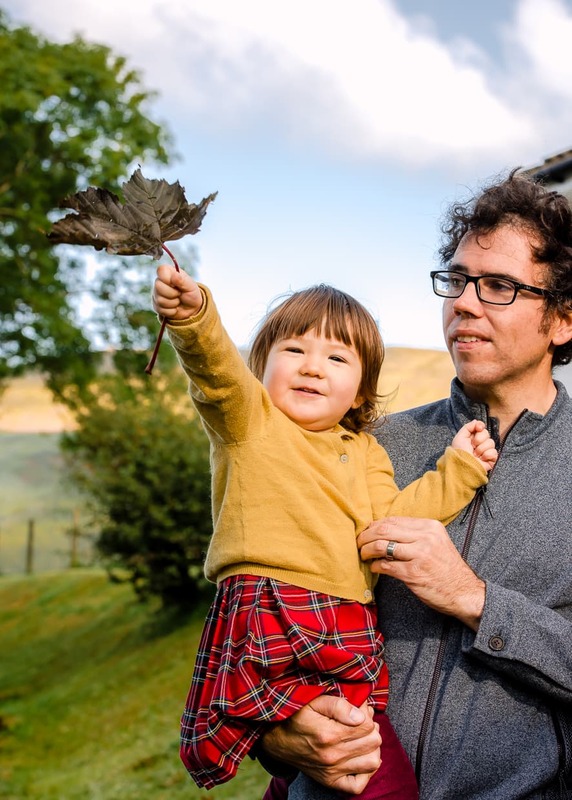 In this post, I’ll talk about why we chose Invercoe, and how it met, fell short, or exceeded our expectations. Of all the campsites we stayed at, the Invercoe Caravan and Campingn Park was the only one that came as a spur of the moment decision. 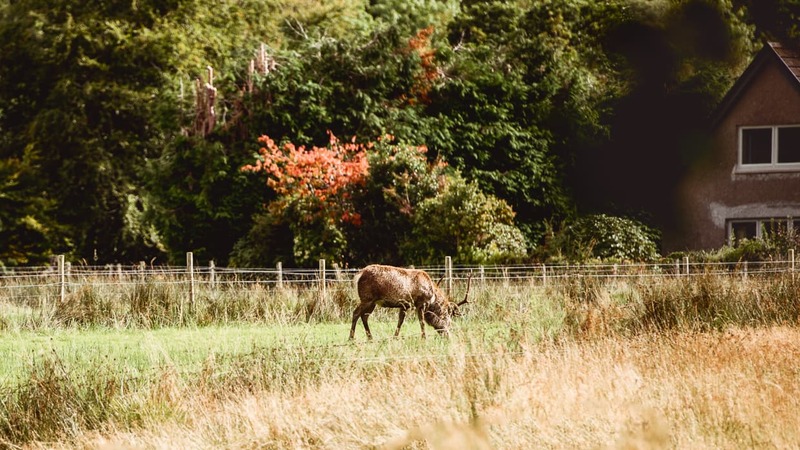 Our two previous campgrounds were both Caravanning and Camping Club Sites, which found through their respective websites. But we had read that the club site in Glencoe was rife with midges (I’m sorry, we never went there so I can’t confirm it one way or the other), so we decided to give up our discount and find an independent site. We had settled on a campsite right next to Loch Levin, but upon arriving we determined that it wasn’t up to our standards. The grass was trashed, and the bathrooms were very distant from the pitches (and not really very appealing once we found them). 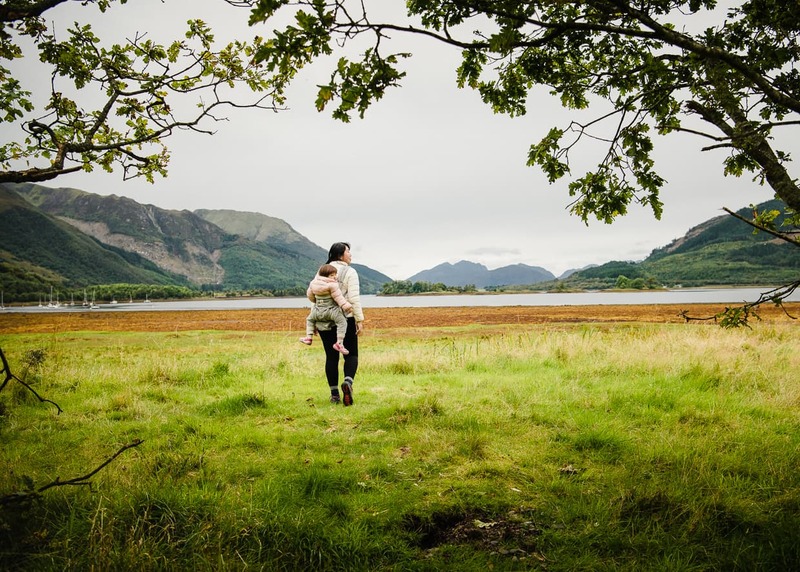 Invercoe Caravan and Camping Park is right on Loch Leven in Glencoe, Scotland. Luckily, we hadn’t made any reservations yet, so we were free to keep looking. On our way there, just a couple miles up the Loch, we had passed by a campsite called Invercoe, and we decided to go check it out. The Invercoe Caravan and Camping Park was actually quite nice looking, even once we had driven inside and seen it up close. We tracked down an employee and told them we’d like to book a tent pitch for the month. They looked a little surprised to have a walk-in requesting a whole month, but they were very accommodating and told us to go ahead and chose any pitch we’d like. At our previous campsites, the pitch had always been assigned to us so this was refreshing. Though to be fair, they had far more vacancies than the other campsites, probably because Summer was drawing to a close. One campsite shouldn’t be any harder to review than another, but I still think this one will be a challenge. 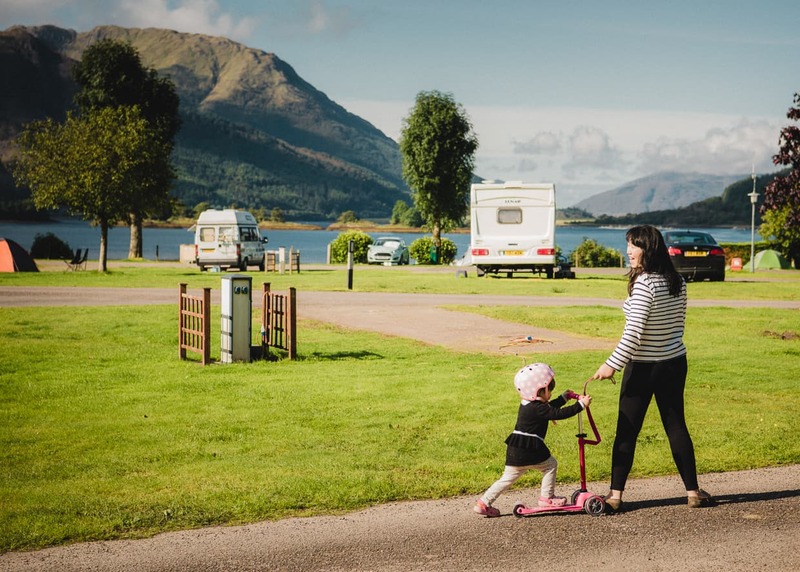 I sort of think that the Invercoe Caravan and Camping park was the nicest campsite we stayed at in Scotland, but it was also the least enjoyable month of our Summer in Scotland because of factors that were out of the campsites control. No matter how good a campsite’s facilities are, tent camping for a month of rain is still tent camping for a month of rain. That being said, I’ll do my best to separate my memories of the whether from my memories of the campground and its staff. 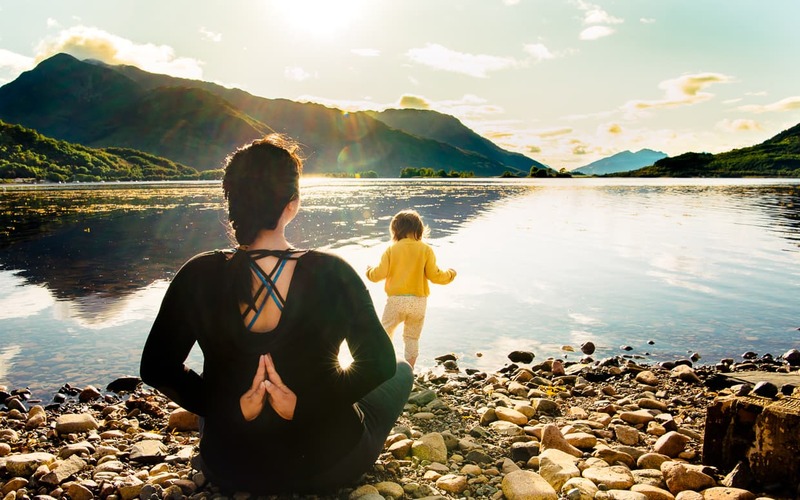 The Invercoe Caravan and Camping Park has several options for campers. There are pitches for caravans (RVs) and grass pitches for tents. All the sites I saw had electric hookups available. There are also a number of trailers, wooden lodges, and camping pods. 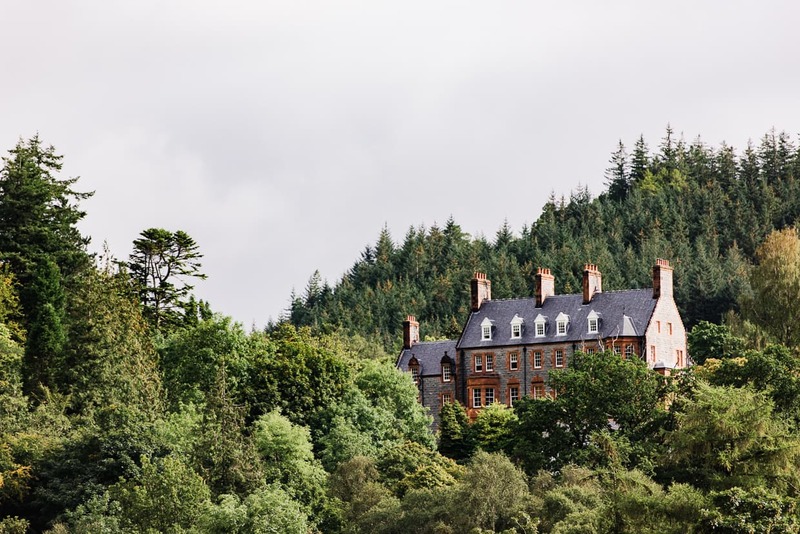 One side of the campsite faces Loch Levin, and on the other side, a tall hedge separates the grounds from the road. 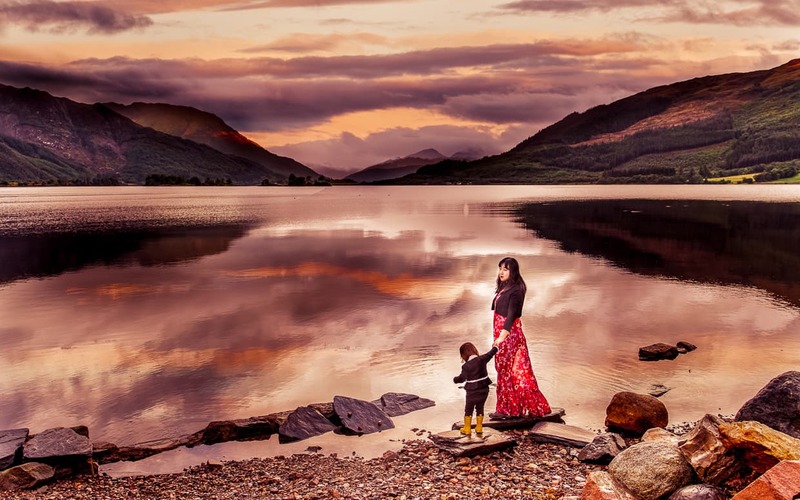 Invercoe Caravan and Camping Park in Glencoe, Scotland. The campsite store is well stocked with essentials and a few treats, and though I wished it had stayed open a little bit later each day, we found it useful on a number of occasions. Right next door are the men’s room, the women’s room, and an accessible bathroom that doubled as a family room for when we needed to give Lisa a shower. The dish room was really nice, with plenty of sinks and dish racks. I never had to wait in line to clean up after dinner. Like the other campsites we used, this one had laundry machines and dryers. 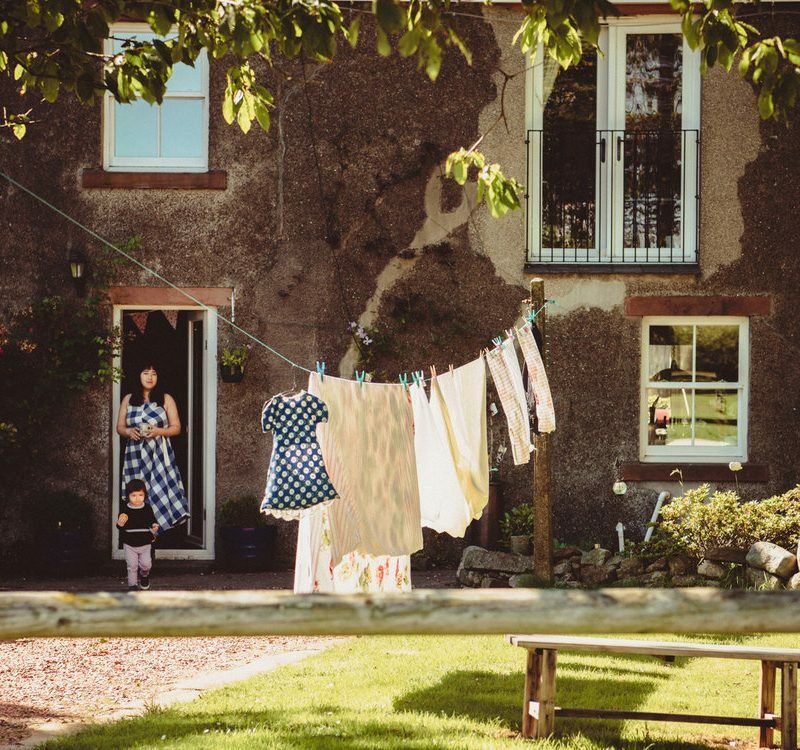 Because of the weather, we couldn’t dry our clothes on the line like we could in Skye and Dunbar, so we had to use the dryers. Unfortunately, they were expensive and didn’t do a very good job. We wound up hanging our clothes inside the tent, which got very crowded and damp. There is a playground, which we were excited about, but which we didn’t use on account of all the rain. Obviously we only tried the tent pitches, but they were nice and grassy. Stones and roots were almost nonexistent. 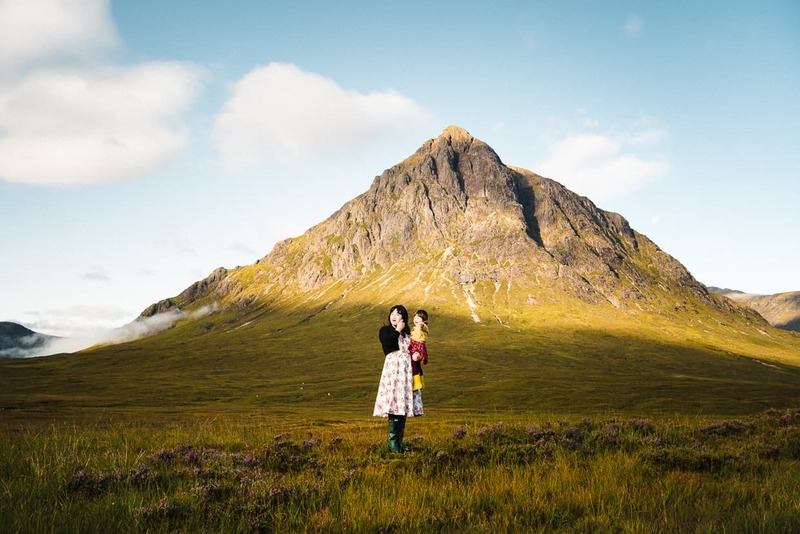 We tried two pitches during our stay in Glencoe, and one held up better than the other. The first pitch was near the road and it was on a bit of a slope. There were plenty of level pitches, but we wanted one that was near the playground and we wanted to be farther from the main driveway where we would have to worry more about her running out of the tent and into danger (for more on the concerns of parents camping with toddlers check out our toddler camping overview post). Our first tent pitch in Glencoe. Unfortunately, it started raining the next day, and it just didn’t stop. As the ground started getting wet, that sloped campsite turned out to be a mistake. As we walked across the floor of the tent, the slight friction of our foot sliding downhill just a little bit with each step gradually wore down the grass and turned the soil beneath into squishy mud. before long it was hard to keep our balance on account of the floor beneath us being so unstable. Eventually we had to change pitches (leaving a muddy hole behind us). We found a nice flat one and felt lucky that the rain let up for one afternoon so that we could break down and set up our tent again. There were a couple of puddles nearby, but the ground under our tent never deteriorated like before. This pitch had the added bonus of being closer to the washrooms as well. 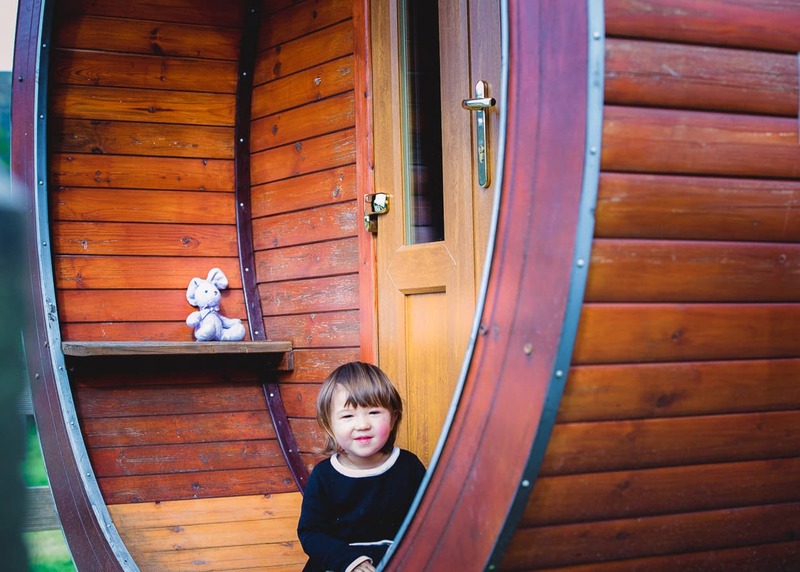 For our last two nights at Invercoe, we upgraded to a camping pod. Toward the end of September in Glencoe, it was starting to get really cold at night, and the camping pod was just a lot warmer than our tent. There was a heater inside, and much better insulation than we had in our tent. It also had platforms with mattresses for us to sleep on, though we still had to use our sleeping bags (so it counts as camping!). But what we really enjoyed about it was the deck and picnic table outside, which allowed us to eat our meals on a table instead of on our laps. It even stopped raining on our last day so we got to enjoy a picnic. 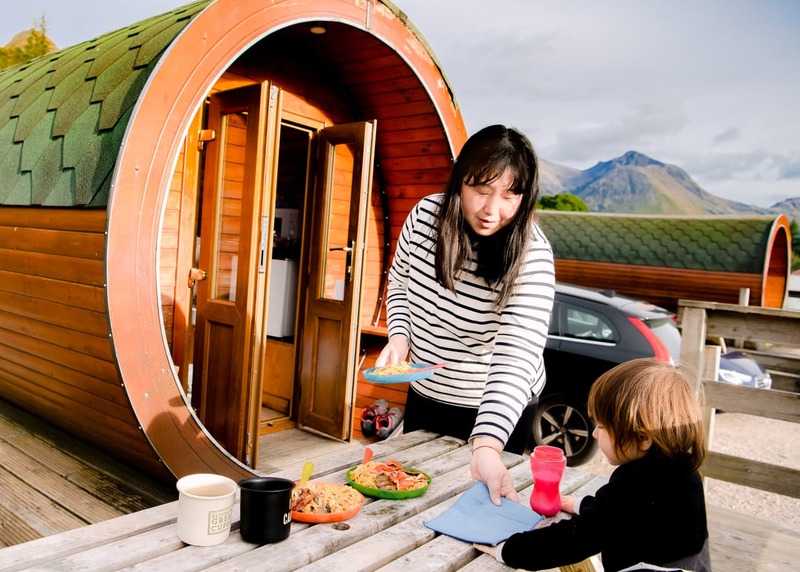 The added benefit of using a pod for the end of our stay – a trick we picked up camping on the Isle of Skye – was that we didn’t have to pack up on the morning we left. That was already done, and we could just climb into the car and leave. The toilets were nice and clean, though I remember thinking they could have been closer to the sinks. Most of the sinks were over next to the showers, which did make them ideal for shaving while you were getting cleaned up in the morning. Of course, if you look at pictures of me while we’re camping, you’ll see how much shaving I did. The showers were also nice and clean, and they had mats on the bottom in both the shower stall and the changing stall, which was nice because it meant you could dry off without standing in a puddle (a pet peeve of mine). The water temperature in the showers was controllable, but the pressure could have been a little stronger. The wifi at Invercoe was much better than it had been at either Dunbar or on Skye. That being said, it was still campsite wifi and it was still slow. Being the best just means it wasn’t constantly kicking us off for seemingly no reason. We need to have wifi while – even while camping – because we have to work on this blog that you are reading right now, and because out in the wilderness mobile data is spotty at best. Do you see any cell phone towers here? 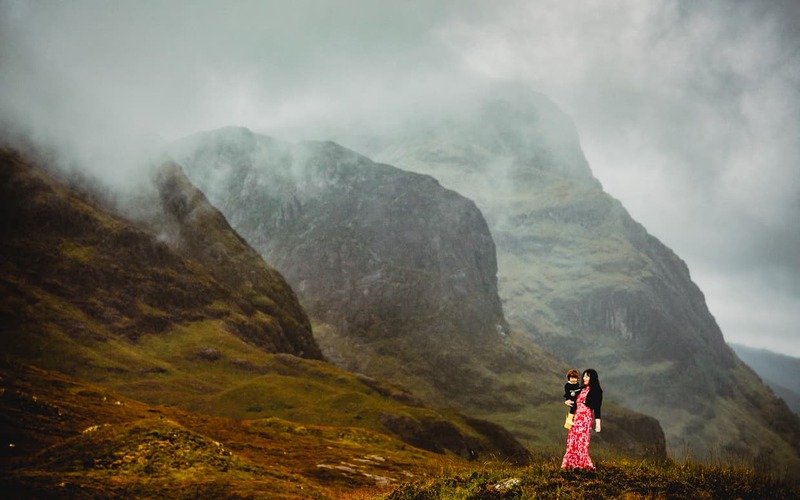 You might think we must have gotten a lot of blogging done while we were in Glencoe, seeing as how it was raining all the time so we were stuck inside the tent. You would be wrong. It turns out that being inside a tent is actually very counterproductive if you are trapped there with an energetic toddler who is hungry for attention and hasn’t gotten to play outside in days. It was maddening to the point where we almost had a meltdown, but, once again, that really isn’t the campsite’s fault. By the way, if you are traveling, you should really consider signing up for a VPN service to protect your data while you are using public wifi. 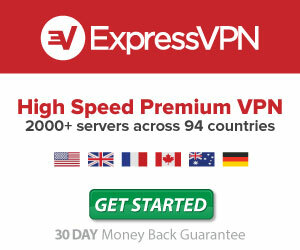 For a full discussion on the importance of a VPN while traveling, read our review of ExpressVPN, the service we have been using since we started our journey. If you are staying in a pod, trailer or lodge, this might not be an issue, but if you are tent camping, its nice to know the there is some kind of shelter around in case there is a problem with your tent. Of course, it was always possible to run for cover in the dish room or the laundry room, but if it wasn’t an emergency, there was also a picnic shelter there with (I think) four tables and a grill. We didn’t use it for cooking, but we did take Lisa there to play once in a while when we needed to let her stretch her legs. The view from the campsite is amazing! 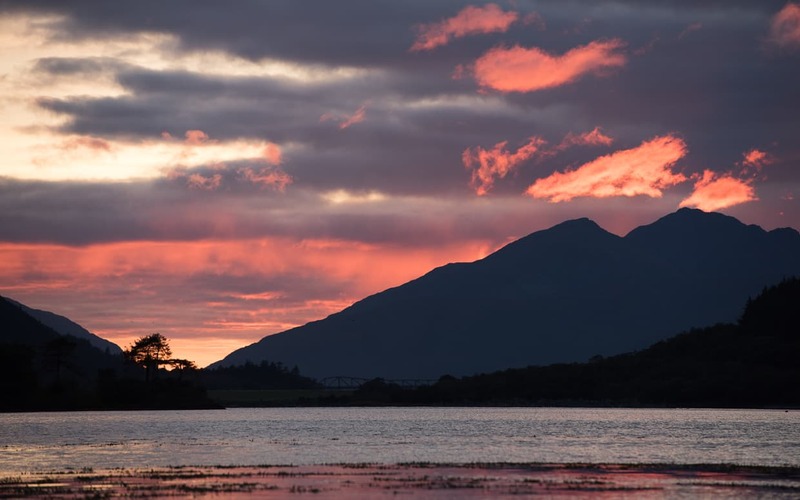 In the evening, you can watch the sunset over Loch Leven to the west (weather permitting! 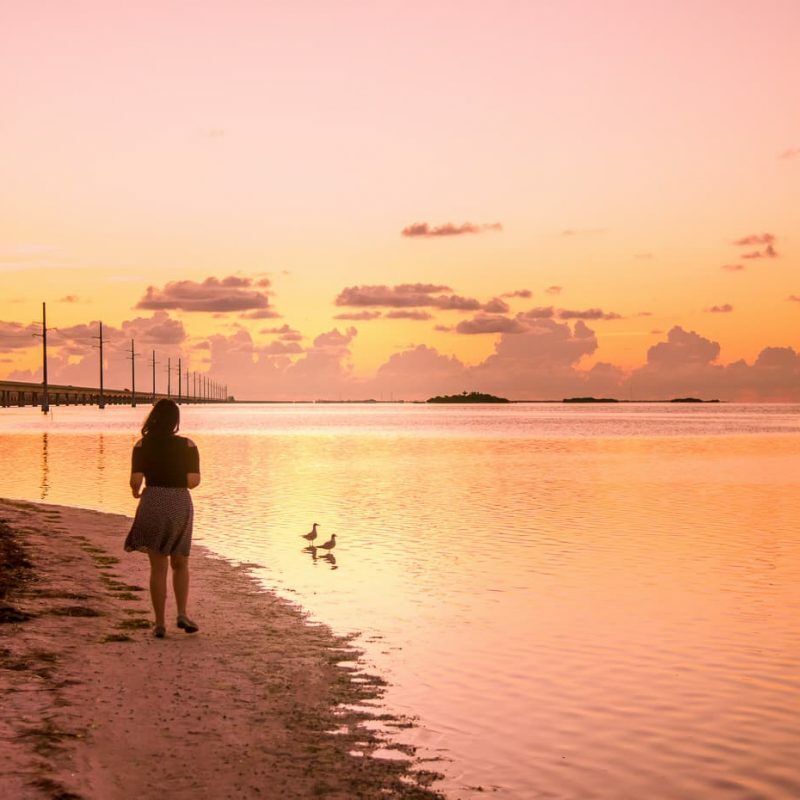 ), and see the small islands turn to silhouettes below the golden sky. In the morning, the sun falls on rocky cliffs and mountains over the trees to the east. Even with the lousy weather, I still found myself running back to the tent for my camera on a pretty regular basis. Sunset over Loch Leven from Invercoe Caravan and Camping Park. Speaking of the view, if you are looking forward to taking photos in Scotland, keep in mind that the weather will limit your opportunities. You can make sure that you never miss an opportunity by understanding your camera and leaving nothing up to luck. 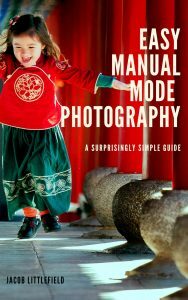 My new e-book, Easy Manual Mode Photography, is an affordable and quick way to take control of your images, capture memories, and support helpful, unbiased content like this article. The staff at the Invercoe Caravan and Camping Park was definitely good. The first person we met was the owner, who we found to be vigilant in his duties, yet laid back in his interactions with the guests. I still remember that when we apologized for how our tent had muddied up one of his pitches over two weeks of rain, he said this. “If I’ve got a muddy pitch, that’s a problem. If I’ve got a grassy pitch with on one on it, that’s a bigger problem.” Those are the words of someone well practiced at making guests feel welcome. 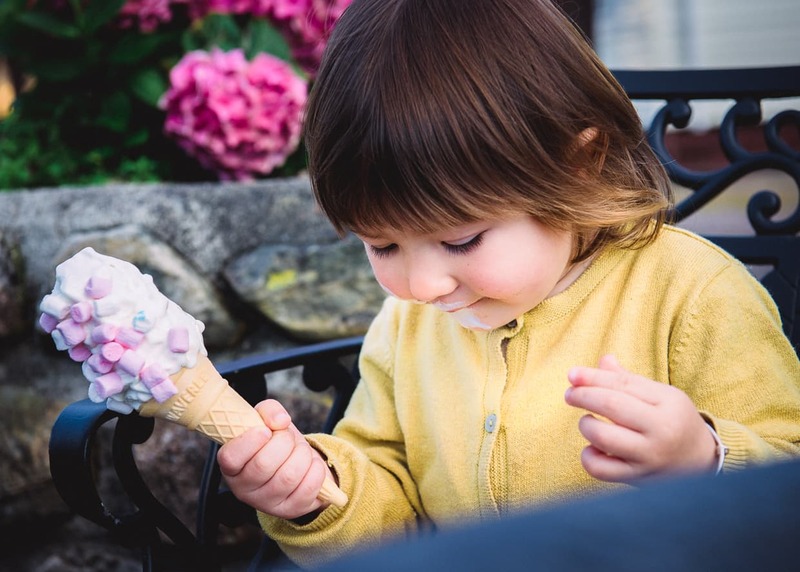 Also, on Sunday nights, an ice cream truck usually showed up, even though it was cold outside. 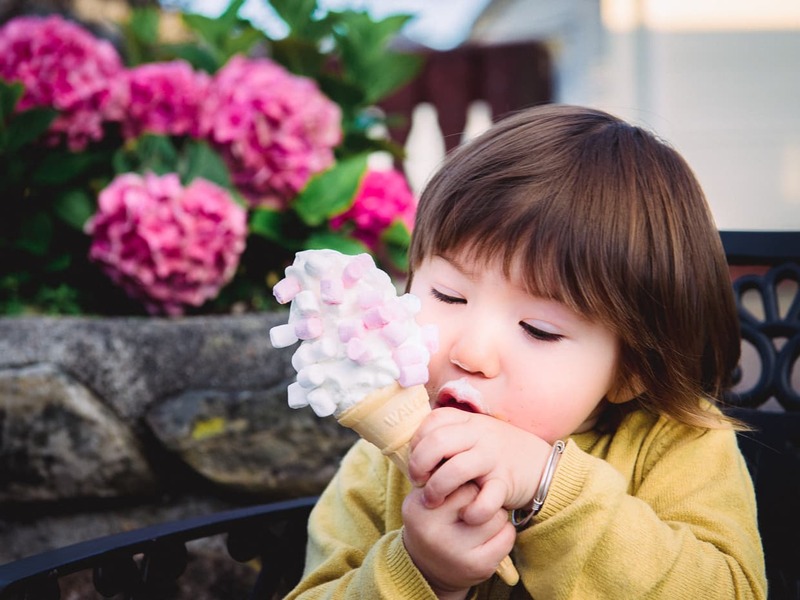 Everyone loves ice cream! 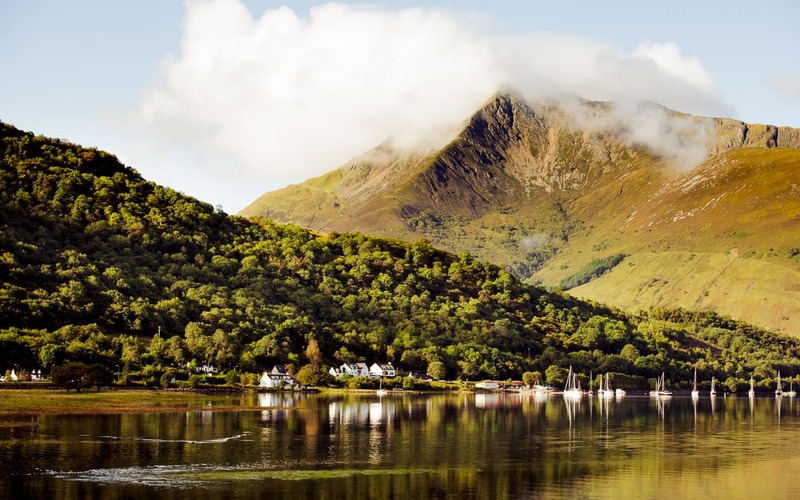 The address of the Invercoe Caravan and Camping Park is listed as Glencoe Ballachulish, PH49 4HP, UK (Google Maps). For those readers who are unfamiliar with UK postal codes, that PH49 4HP is kind of like a street address. In densely populated area, it might point to a few addresses, but for the most part it will take you right to the place you are looking for if you plug it into a GPS. 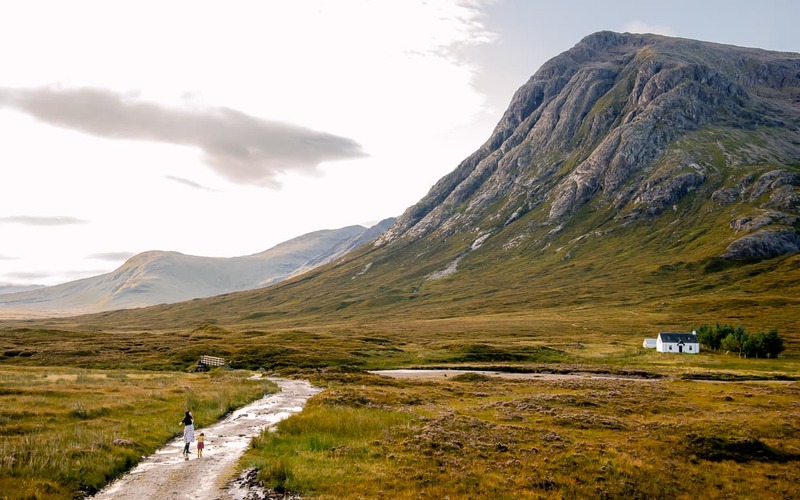 And by the way, we recommend having a designated GPS device while you are camping in Scotland, because the spotty mobile data makes phones a little unreliable. For the locations below, I’ll be using the postal codes for the addresses and including additional directions when needed. 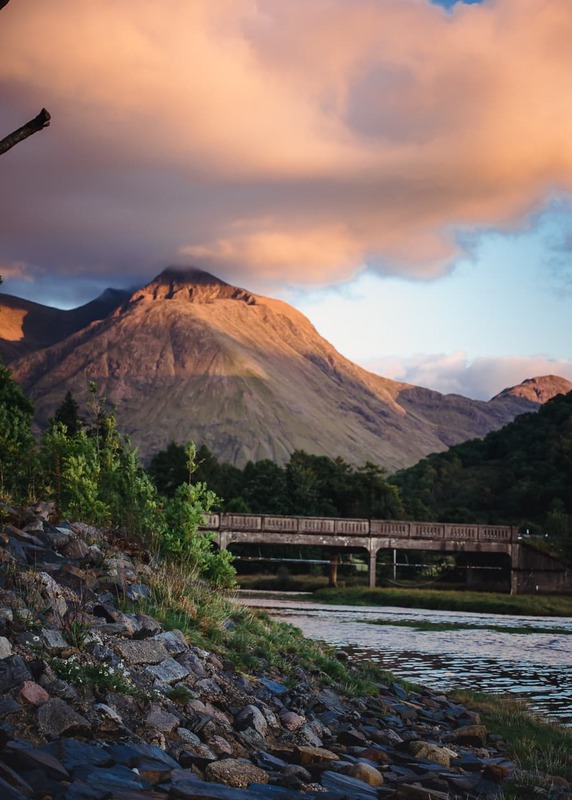 There is plenty to do around Glencoe, whether you like mountains, water or shopping, a short drive will take you to what you want to do. The weather hampered our exploration a little bit, but we still found some fun and beautiful places to enjoy. Loch Levin is a really pretty body of water. The hills and mountains that surround it are steep, and the water is very clear. When the weather was nice enough, it was Lisa’s favorite place to play. She spent hours throwing rocks in the water and giggling at the splashes. There were surprisingly few insects, and it was actually possible to relax there without getting devoured. 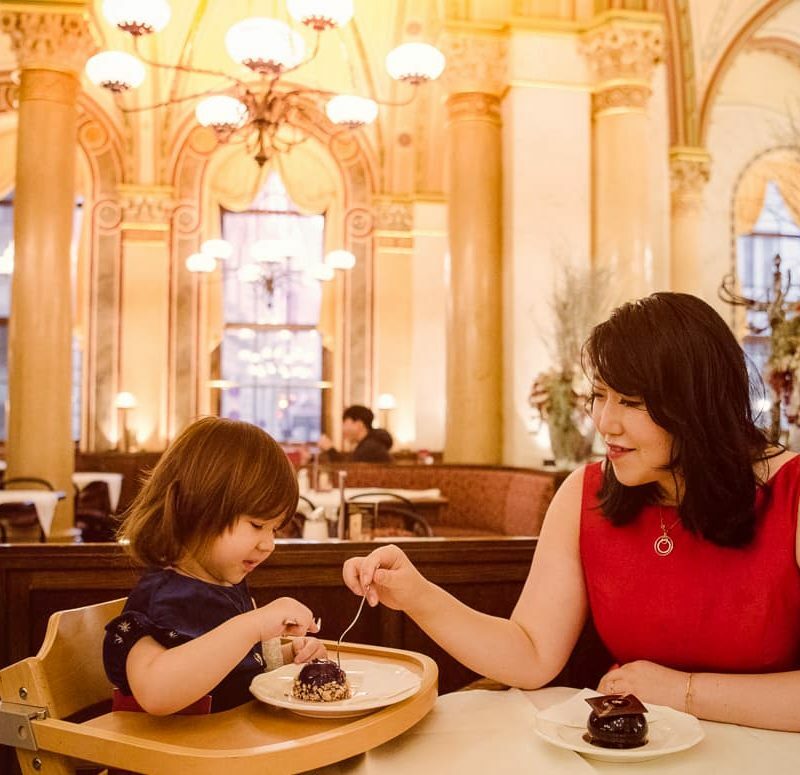 This is as nearby as nearby attractions get. Loch Levin is right on the campsite, and you can walk right down to the water. 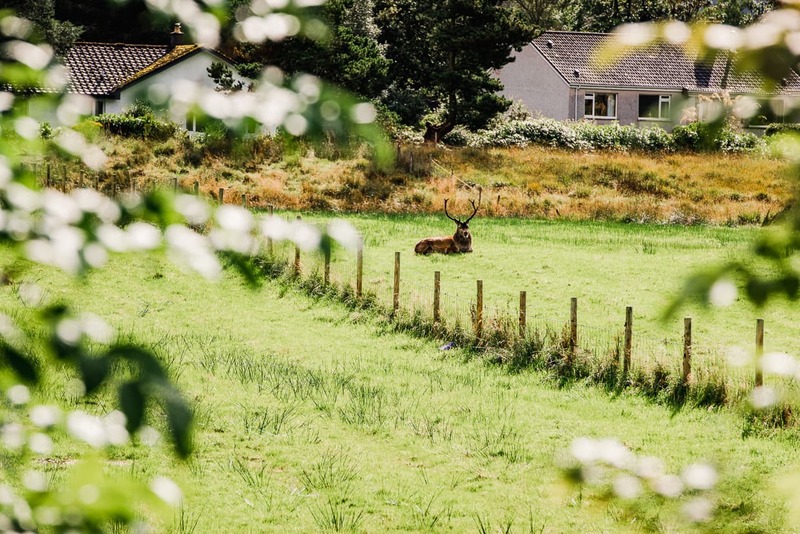 If you follow the road across the bridge (look to your left to see a huge deer living on some kind of ranch), you will come to a series of paths that take you across the grass for more exploring. It’s a little soggy one there, but it’s a fun, safe place for children to exercise and play. By the way, the stylish baby carrier in this photo is the Ergobaby Omni 360 (our review here). 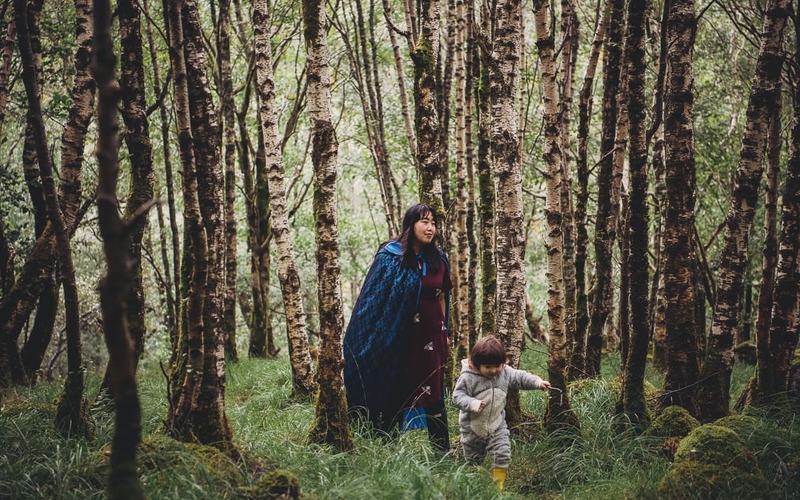 You will definitely want a baby carrier if you are camping with a toddler or infant. 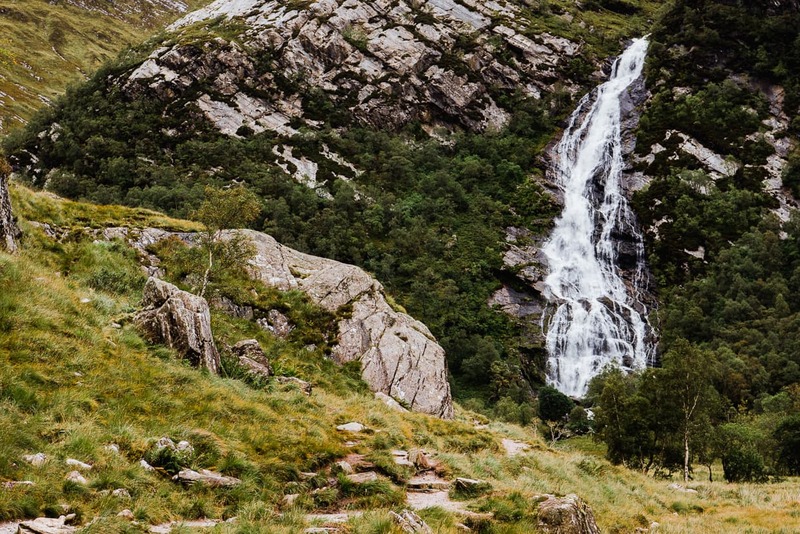 Steall Falls is a towering waterfall in Glencoe. The falls splash down in a pool of water at the foot of a mountain, and it’s possible to hike to that pool. The trail isn’t very long, maybe a 30 minute hike if you know what you are doing, but it can be a little bit intimidating. The trail is well maintained with stone steps and bridges, but there are parts where streams flow across sloped rocks, making for slippery footing. Unfortunately, those slippery, sloped parts happen to be right on the edge of dangerous looking ravines. Having read about the hazards of the trail, I went and scouted it on my own first before I took Dannie and Lisa to explore. The trailhead was a little difficult to find. The trailhead is called Ben Nevis Parking on Google Maps, and it looks like this (street view). Just putting “Steall Falls” into the GPS took me to the wrong location. Driving to the trailhead, like driving on many of the backroads in Scotland, is a scary journey on a one lane mountain road. I decided that Dannie and Lisa probably weren’t up for the hike all the way to the falls, but the trail itself was actually very pretty, and I took them to explore it all the way up to (but not including) the scary part. 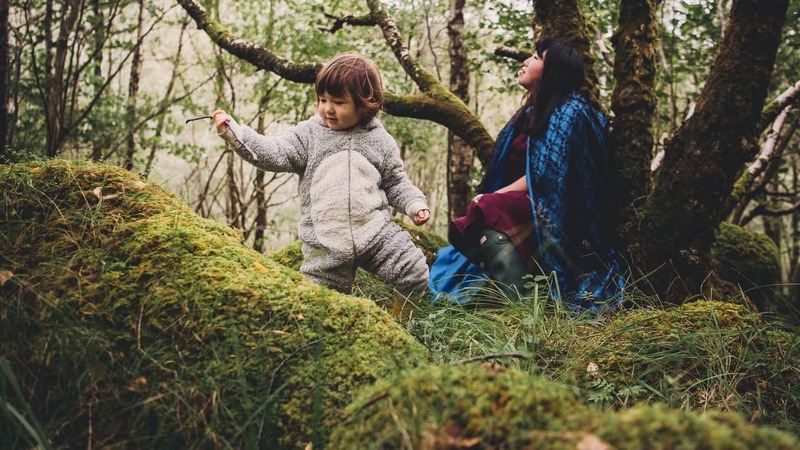 Lisa dressed up in her penguin jammies and we played around in the woods together for a photo shoot. 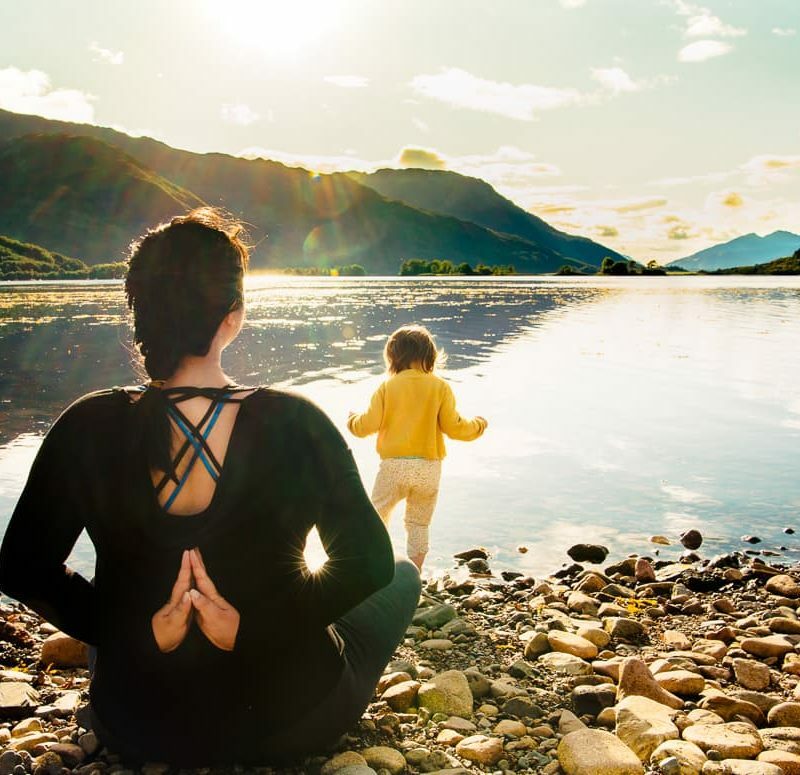 Fort William is the biggest town in the area, brimming with hotels and Bed and Breakfasts for travelers who want to explore the Glencoe area, but aren’t so interested in camping. It’s a good place to go if you need supplies or if you just want a break from the outdoors. We bought some warmer clothes there when the weather started cooling off, and we also went there for bigger grocery stores when we got tired of the slim vegetarian options at the closest Co-op (Google Maps – UK Postal Code PH49 4JS). 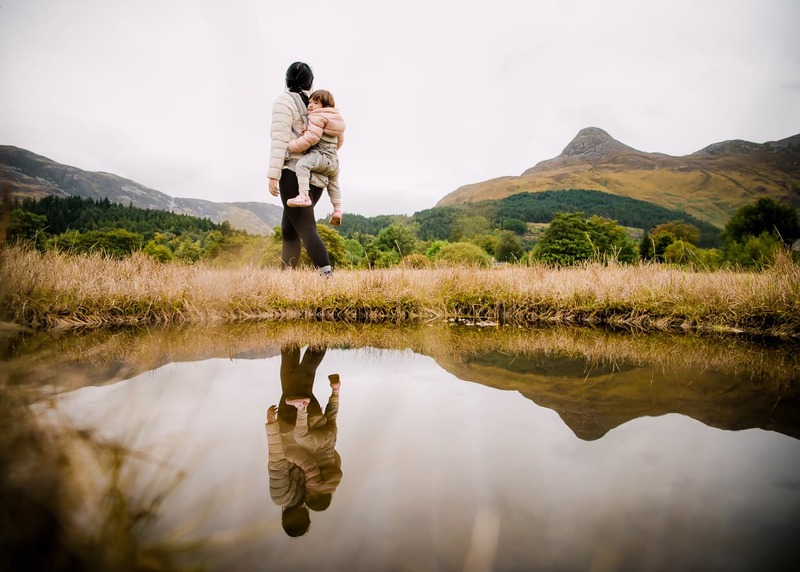 There were a few places that we thought about returning to for a photo shoot in Fort William, but we never got around to it. The Nevis Center is a little shopping and convention hall that just happens to house the biggest indoor soft play area I’ve ever seen. 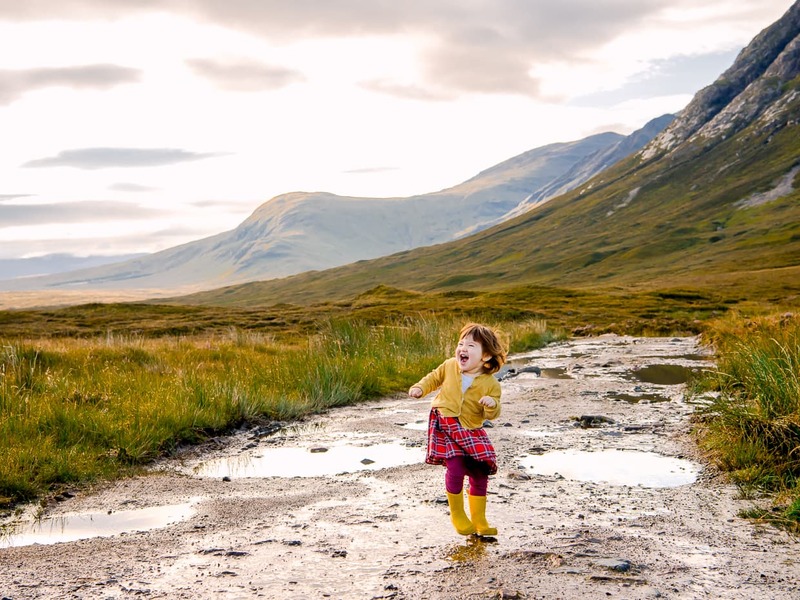 We drove there several times during our stay in Glencoe because 1) it was always raining and we felt bad that Lisa wasn’t getting much exercise or play time, and 2) they had reliable wifi, albeit with a very expensive hourly fee. It was a good place for one of us to play around with Lisa while the other got some work done while sitting on a chair instead of a cold tent floor. It also happened to be right across the street from a Morrisons (Google Maps – UK Postal Code Ph33 6XZ), where we could refill on fresh vegetables and faux meat. A82 (Google Maps) is a road that heads east out of Glencoe, and I put it on here because the views from the road are breathtaking. Rather than strap Lisa onto our backs for a hike in the rain, when we wanted to get some photo shoots in, we just took a couple drives down this road and found more scenery than we could even handle. Of course, you have to exercise caution whenever you are taking photos near the road with a toddler, but it was probably safer than climbing over slippery rocks. Maybe the best view in Glencoe, Scotland. And yes, it was raining. There are also a number of places where they have built car parks that hang over cliffs as the road winds through steep gorges. We didn’t stop at those because they were crowded when we were passing through, but we could definitely see taking some photos there. If you’ve taken any there, feel free to make us jealous by telling us where to find them in the comments. 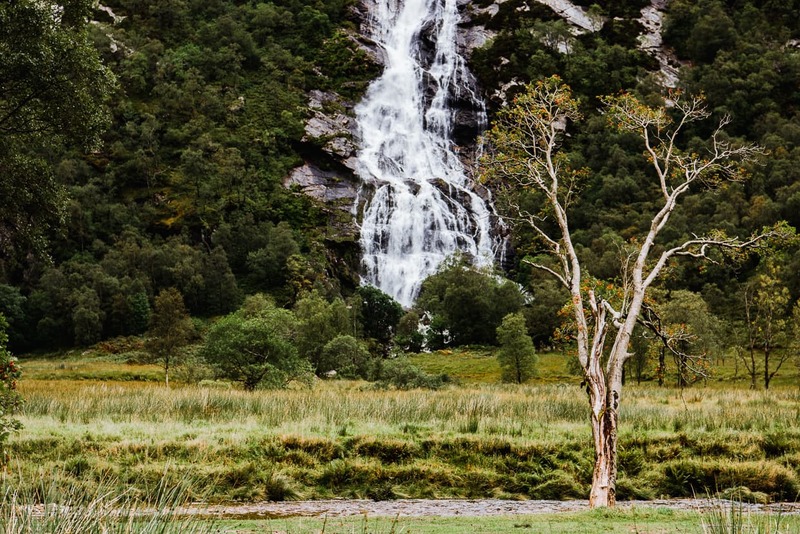 Our stay in Glencoe, Scotland was cold and rainy, but the Invercoe Caravan and Camping Park never really let us down. If we had visited in the springtime (which the owner recommended for our next visit) instead of September, I think we would have had a really nice time. 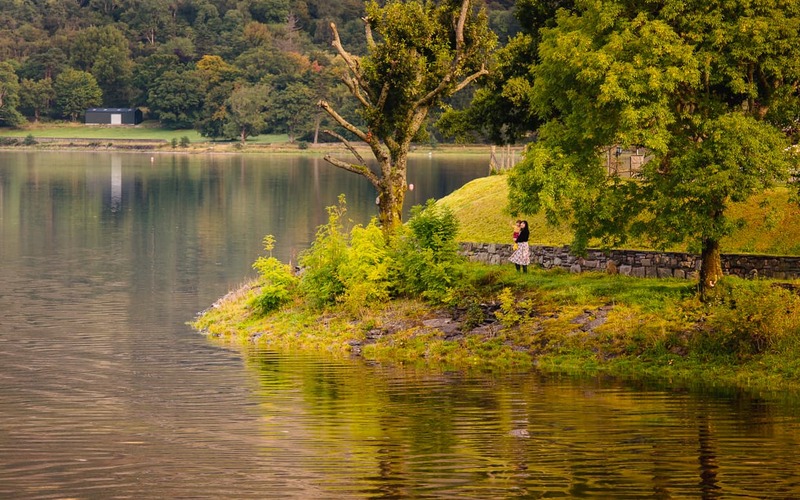 We’d definitely recommend the campsite, so go ahead and book it. Some building on a hill near our campsite. 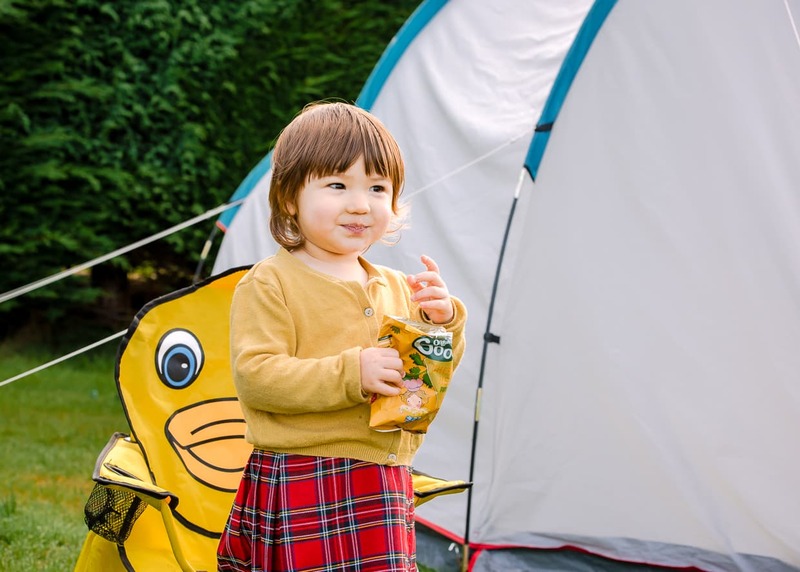 If you found this review helpful, consider checking out some of our related posts like 3 Months Tent Camping in Scotland… With a Toddler, and our Isle of Sky Camping and Caravanning Club Site Review. Our review of the campsite we stayed at in Dunbar will be posted in the next week or two. If you are interested in how we are trying to finance our travel lifestyle, check out Operation Digital Nomad, which you can help support just by visiting our resources page to check out (and maybe purchase) some of the travel gear and online resources we use. Thanks for stopping by, and good luck with your own adventure. Stay dry.